This week on Raven Radio we continue to work on the Holy Grail of good sound with our new board! And continue our talk on Death and Funeral rights past and present. Also with folks thinking and as goofy as it sounds living local.We did this show a few years ago but it must be one of those that evaporated into the mists of the ethernet. Innergarth and Outergarth/ Why is it making such a resurgence? A lot of folks are talking about it blogging about it Hell I even wrote a little bit on it. Are we taking it to far? Not far enough? How the hell does this tie into Death? This week we tried to tackle the enormous topic that is death, and how it was handled by historical heathens as well as touching on how it is dealt with in modern society. And in addition we were graced with the Semi Tame Recon Heathen Current Asapope and our favorite Texan slumlord, Hundur Bubbason, and his take on the breaking news of Heathenry, and then he finished breaking it! Episode 128 – What if our kids convert? When we were a few years younger, Chuck and Bob used to joke that the way our children would rebel is by converting to Christianity. This turned out to be not so much of a joke after all, as both of us had kids who did just that. So how did we deal with it? How would YOU handle it? We’re back after a short vacation! This episode is on the topic of mixed religions in a marriage and the difficulties and challenges it can present. 3 days ’til the return of Raven Radio. Can’t WAIT!!! Well the studio move is complete hopefully everything is up and running. We’ll find out this Sunday as we do our first broadcast in our new studio. Ok it is my closet sized office at home in Edgewood. But it is NEW to Raven. We had to move the gunsafe, wedge in a desk for Jake, shoo the cats out. We have a new Skype number, (Tried to get away from it but not yet. CURSE YOU SKYPE). The new Skype is heathenradio and our new hotline is 505 715 6703. One major change is that Raven Radio is now totally LINUX POWERED! The main box is one that I built off an Asus board, AMD Phenom 2 hexacore processor 3.2 gigs per core 8 gigs of ram and a 2 terrabyte drive. We are running Dream Studio, built from Ubuntu 12.04 and Internet Disk Jockey (IDJC 0.8.2) is our broadcast engine. Tune in and join us with the first show from Edgewood NM! Episode 126 – Good, Bad, and WTF were we thinking?? It’s been a long, strange trip! This week we take some time to review what we think are some of our best, worst, and great holy Powers were we on CRACK?!?! moments. Don’t forget, no show the next couple of weeks while we move our studio location, and watch this space for updates. We continue our discussion of luck and worth with guests Gary “the Banned” and Hundur. Lots of great discussion with our guests and some awesome points of view on how these concepts relate to us as modern heathens. Where: Bataan Park, near the intersection of Lomas and Carlisle in Albuquerque, NM. What: With few exceptions, such as Mountain Haven Kindred, the local Heathen community does not typically have open rituals. 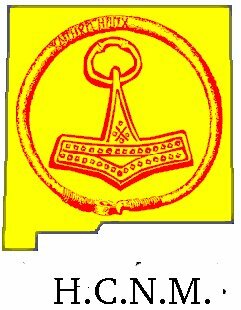 Please join the Heathen Council of New Mexico for its first ever blot open to the public. We will be honoring , one of the more important goddesses in Heathenry. is a goddess of winter, of skiing, of the hunt, and of vengeance and reconciliation, among many other things. After the leader of the blot announces the purpose of the ritual and hails the powers of the seasons, there will be at least one round of open hails. While it is most appropriate to hail the goddess for whom the blot is being held, other powers, such as her kin among the gods (including Njord, Frey, and Frejya), one’s ancestors, and/or the wights of the land, are also appropriate subjects of hails. If desired, small offerings, like the recitation of poetry or individual libations, may also be made. After the open hails, a libation will be poured. Pot-luck snacks to follow; snack-type finger food to be shared that does not have to be kept warm is most welcome, though not required. This is an alcohol-free event; fruit juice will be provided for the open round of hails. Participants are encouraged to bring their own favorite horns, mugs, or other drinking vessels, but paper cups will also be provided. Also, this is an outside event in February, so please dress accordingly. On this episode, the hosts are joined by Gary “The Banned” aka Thorsmadr for a discussion ranging around the intermingled topics of worth and luck as they apply to modern and historical heathens. After an hour, it was decided that such a huge, complicated, and deeply philosophical topic should probably be extended on to another show.